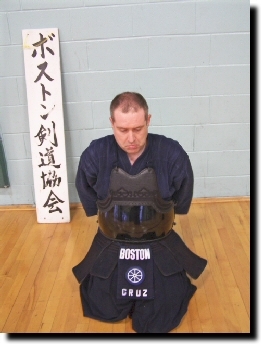 Welcome to Boston Kendo Kyokai. You are about to embark on a path of self discovery that will challenge you to persevere in the face of adversity, to accept setbacks with equanimity, and change the way you think about yourself. 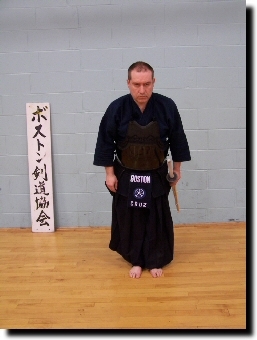 Kendo is not an easy martial art to learn, let alone master. In fact, put away all thoughts of mastery and focus, instead, on reaching your fullest potential, to whatever level of skill that may lead. In the final analysis, skill is not the measure of success in kendo. Rather, it is the manner in which you conduct yourself in the dojo and out, your respect for others, your compassion for humanity, your humility and self-restraint. You will need to be patient, keep an open mind, and practice diligently at the dojo and at home as well. We only practice twice a week for a total of four hours, therefore it is critical that you maximize that time. Move quickly during practice, without rushing; avoid milling about waiting for someone to notice you; actively seek out instruction. 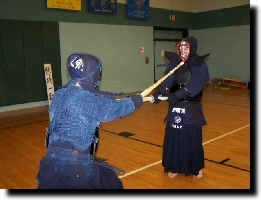 There is a tremendous responsibility placed on you to determine your own future in kendo. That is not to say that you will be ignored, to the contrary, everyone at our dojo is more than willing to share their knowledge and help you to become integrated into the routine practice. Every member of our dojo, from the highest ranks down to the first day beginner, is equally worthy of respect and consideration. However, sometimes you will have to be proactive in your approach to learning. 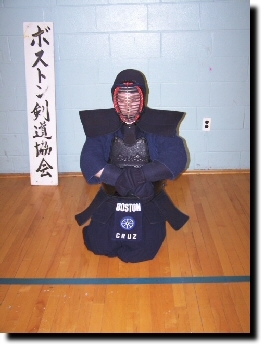 It is important that you learn about the manners and etiquette of kendo. This attendance to tradition, along with kendo kata, is what differentiates kendo from sport. You should bow (ritsu rei) before entering and upon leaving the dojo. You should avoid joking and horsing around inside the dojo; always assume a serious attitude and treat the dojo as a place where something important transpires. Line up quickly and quietly when the senior student (sempai) calls the dojo to line up (sei retsu). Check to make sure you are aligned with the person to your right holding your shinai in your left hand. 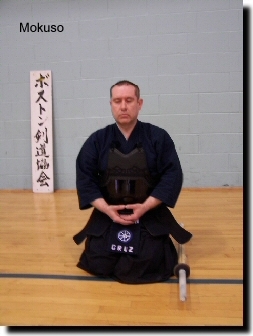 Seiza is the traditional Japanese seated position. It is often difficult for non-Japanese to be able to sit in this manner right away. Seiza developed in Japanese culture in the context of the Japanese house wihich doesn't have chairs or couches. People sat on the floor, or more accurately on tatami mats that covered the floor. Kendo maintains this tradition. At the beginning and end of all kendo practice all dojo members wil sit in seiza to put on their bogu, bow in, and take off their bogu. After lining up wait until sempai instructs you to be seated (seiza). Sit down gently, under control, and avoid plopping the floor with a thud. 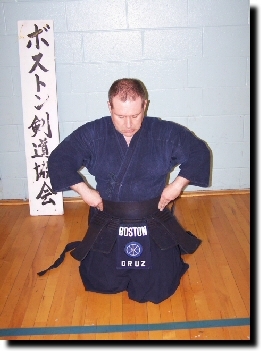 Assume the seiza position by stepping back with your left foot and lowering your left knee to the floor. Bring your right foot back and under, next to your left. Slowly lower your body until your buttocks are resting on your heels. Make sure your knees are about one or two fists apart. This may be the first test of the difficult nature of kendo. Also, try not to let your shinai crash to the floor, but rather place it there gently. Check to make sure you are still aligned to the person to your right, knees and shinai in straight lines from sempai to most junior student (kohai). Sempai will then call the dojo to attention (ki o tsuke). Sit up straight, chin pulled slightly in, mouth closed. Place your hands in your lap palms up with your fingertips overlapping and your thumbs touching tip to tip. The feeling should be that you are holding an egg in your hands. If you press too hard the egg breaks; if you do not press the egg falls to the floor. Sempai will then call the dojo to engage in a moment of meditation (mokuso) to clear the mind of distractions and prepare for practice. Breath naturally through your nose, using your abdomen and diaphragm to draw the air into the bottom of your lungs. After a while, sempai will call an end to the meditation (yame). At this point sempai will instruct the dojo to face the shinzen, the head of the dojo, and bow (shinzen ni rei). Turn to face the front of the dojo and bow (rei) at the waist placing first your left hand and then your right on the floor in front of you. Your fingers should be extended and joined with your forefingers and thumbs touching, forming a triangle. Keep your back straight and avoid raising your hips. Do not duck your head; keep your neck in alignment with your back. 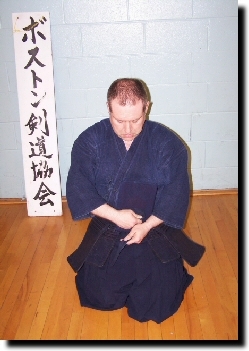 After a short pause, raise yourself back to the seiza position, retracting first your right hand and then your left. Place your hands comfortably on your thighs. Sempai will then instruct the dojo to face the teachers (sensei ni rei). Turn to the teachers and follow the same method described above. However, shout in a respectful tone "onegai shimasu". 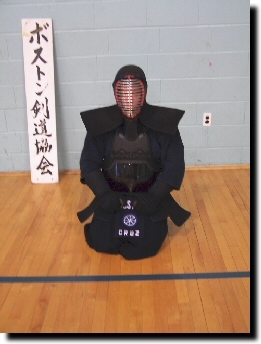 This lets the teacher know that you are eager and ready to practice kendo. The most basic piece of equipment is the shinai. Even though it is fairly inexpensive, from $25- $60, you must treat it with respect. Never lean on it, swing it around casually, or throw it down. When not engaged in practice hold it in your left hand, down by your side with your fingers on the string (tsuru). 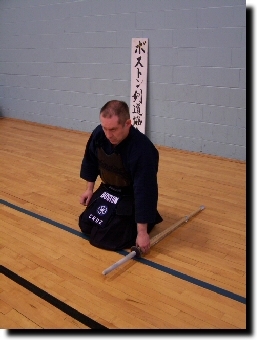 In this position, called sage-to, or hanging sword, the shinai should be held loosely allowing it to hang freely with the tip (sakigawa) just off the floor. The shinai is constructed of four shafts of split bamboo (sake [A]), bound with a leather grip (tsukagawa [B]) and cap (sakigawa [C]), and leather thong (nakayui [D]) wound three times around the shafts, all tied together by a nylon chord (tsuru [E]) running from tip to hilt. 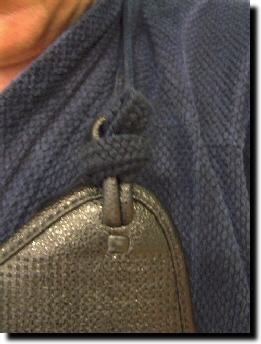 Additionally, a round hand guard (tsuba [F]) is slipped over the tsuka and held in place by a rubber washer (tsubadome [G]). The tip of the shinai is referred to as the kensen. The striking surface of the shinai, called monouchi, is the first one third of the shinai visible from the tsuka to kensen. 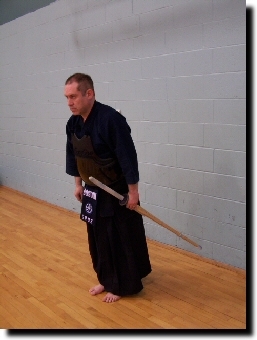 When striking a target you must strike with this portion of the shinai in order for the strike to be considered valid. Proper care must be given the shinai to ensure the safety of your fellow kendoka. The tsuka should not be loose and sliding around. The nakayui, likewise, should not be loose and sliding up or down the shaft of the shinai. Make sure that the sakigawa is not torn or coming apart. The tsuru should be strung tight enough to play "Louie, Louie". Most importantly, make sure that there are no splinters or cracks in the bamboo. Large cracks or breaks will necessitate replacing the broken slat or replacing the shinai entirely. If there are splinters use a knife or some other flat metal tool to plane the splintered area smooth. Periodically disassemble your shinai and rub the bamboo slats with oil. There is special oil available from kendo equipment vendors, but a light vegetable oil will suffice. Do not use petroleum based oils. Once you have reassembled the shinai, pour hot water over the leather parts to shrink them to a snug fit. The next basic piece of equipment is the wooden sword, or bokken, sometimes called bokuto. It is somewhat more expensive, depending upon the type of wood from which it is made, and can cost from $40 - $200. Like the shinai it should be treated with respect. In addition, because it is made of solid wood it can be dangerous if not handled properly. Never swing the bokken at another person for "fun". Many samurai, most famously Miyamoto Musashi, used the bokken in combat to lethal effect.The tip of the bokken is also called kensen [A]. It has a tsuka[B], tsuba [C] and tsuba dome. The proper striking portion is also refered to as monouchi [D]. The ridge line running the length of the "blade" is called shinogi [E]. 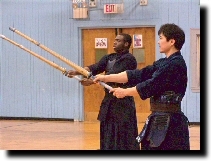 The bokken is used in prearranged forms practice (kendo kata) that employ parry and deflection techniques using the shinogi. In the above photgraph one and two are special types of bokken called suburito used primarily for suburi. They are straighter, heavier and lack a tsuba. Three and four are the standard set used in kendo kata and represent the long and short swords carried by samurai. You will want to keep the bokken clean and rub oil on the "blade" (not the handle) from time to time. 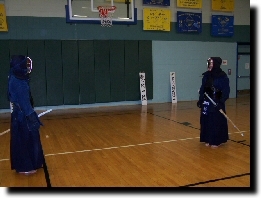 The clothing worn during kendo practice is referred to as do-gi. 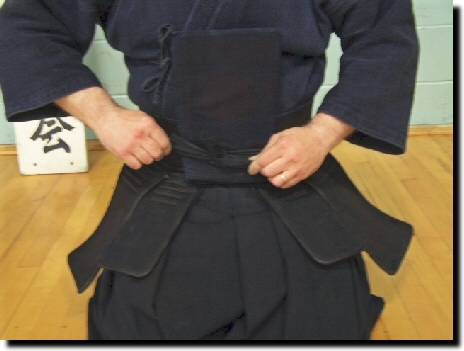 There is a heavy cotton jacket (keiko-gi) and a pleated, skirt-like trousers (hakama). While there are no specific requirements for color, most kendoka prefer deep indigo blue. These come in a variety of qualities and can cost anywhere from $150 - $300 for the set. The keiko-gi is comfortable, absorbs perspiration, and provides additional protection from inadvertant hits. The hakama allows excellent freedom of movement for the legs and disguises somewhat the footwork.The hakama has seven pleats, five in the front and two in the back. 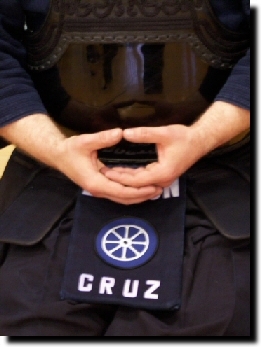 It is said that these pleats represent the seven virtues of kendo: Yuki - courage, valor, bravery; Jin - humanity, charity, benevolence; Gi - justice, righteousness, integrity; Rei - etiquette, courtesy, civility; Makoto - sincerity, honesty, reality; Chugi - loyalty, fidelity, devotion; and Meiyo - honor, dignity, prestige. Of course the most dramatic of the kendo equipment is the armor (bogu) which consists of a face mask (men), a chest protector (do), a hip and waist protector (tare), and a pair of gloves (kote). The bogu is lightweight for mobility and comfort, yet affords maximum protection against the shinai. A reasonable quality set for beginners will cost anywhere from $500 - $800. One of the things to consider is the spacing of the stitching. Generally speaking, the narrower the distance between the stiching the more durable the bogu. Of course, that increases the price. Shop around and compare. 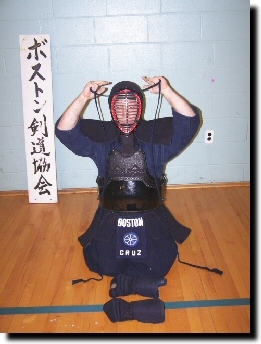 See our links page for some on-line kendo equipment vendors. The men, obviously, protects the head, ears, face, and throat. Although, everyone must take care that you do not use a cracked or splintered shinai, because it could get into the face or eyes. There are plexi-glass inserts to cover the eyes. I highly recommend them, and require them for children. The men is constructed of heavily quilted cotton pad (men buton) with a metal grill (men gane), usually aluminum or titanium, and leather flap () that covers the throat. It is secured to by means of two cords (men himo) that wrap around the head twice and tie in the rear. 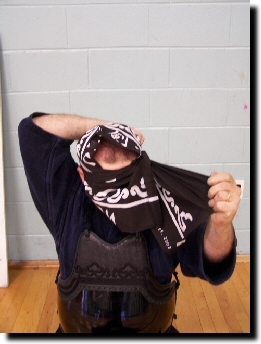 Two large flaps extend out over the shoulders to give some protection to the neck and shoulders. The men is surprisingly light and manoeverable, but it does limit your peripheral vision somewhat. Additional padding is available to slip into the men if desired for extra protection. The do protects the chest and sides. Usually made from bamboo, it also is available in fiberglass or molded, high impact plastic. It is suspended by two cords crossed in the back and slung over the shoulders. A special slip knot secures it to two loops on each side of the do. Another pair of cords are looped around the waist and tied in the rear. It does not cover under the arms, so take care to be accurate when striking the do! 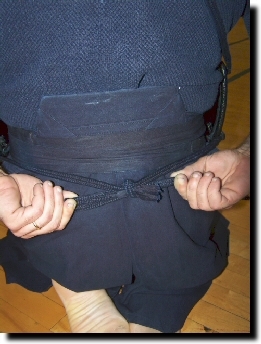 The tare is a type of apron that protects the hips, thighs, and groin from inadvertant strikes. It is not a target and you should always avoid hitting anyone on the tare. It is made entirely from heavily quilted cotton. Sometimes it is trimmed with leather. It consists of a waistband, three large panels, and two smaller panels. The tare is secured to the body by two cloth bands wrapped around the waist and tied in front under the center flap. It is extremely flexible and allows a great range of motion in the hips and legs. 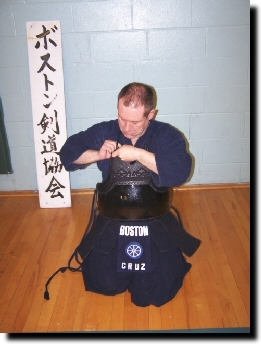 The center flap is usually covered by a cloth bag (zekken) that displays the dojo name, perhaps an insignia (Boston Kendo Kyokai uses a wheel), and the kendoka's family name. 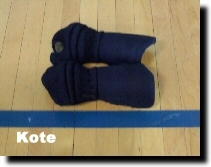 The kote are a pair of padded gloves (mittens, really) that protect the fingers, hand, and wrist. They are made from leather and cotton, with a stiff, heavily quilted cotton cuff that covers the wrist. The first piece of bogu that you put on is the tare. Begin by making sure that the large flaps (odare) are on top. Place the tare against your abdomen and wrap the cords around your waist. Bring the cords back to the front and tie them in a bow under the center flap. Tuck the strings up under the waist band. Pull the tare down onto your hips. Next, place the do against your chest and bring the left himo across and around your back to the right. Fasten the himo to the leather loop using a special slip knot. Bring the right himo across to the left and fasten it to the other loop using the same knot. Tie the bottom himo behind your back in a bow. The do should fit loosely, allowing freedom of movement. The men is next, but first you must place the tenogui on your head. There are two methods for tying the tenogui. The first is to hold the tenogui at the ends and slide it back over your head until it reaches the occipital bone. Bring the ends forward and across the forehead. Tuck the ends on each side and pull the flap back on top of your head. Make sure that the flap is tucked under so that it doesn't stick out the back of the men. The other method is to hold the ends of the tenogui tight and grab the bottom center with your teeth. Wrap the two ends back and around your head and tie them in the front of your forehead. Pull the flap up and back on top of your head. Now you can put on the men. Finally, you can put on the kote. Slip the left kote on first, then the right. Make sure the lacings of the kote are not hanging down, interfering with your grip. Now you are ready to practice kendo. Practice begins with 10-15 minutes of warm-up exercises. It is important to stretch and limber your muscles and joints before any kind of strenuous activity such as kendo. Pay specific attention to your wrists, shoulders, legs and ankles. An all too common kendo injury occurs to the Achilles' tendon when not enough time is spent stretching this part of the body. 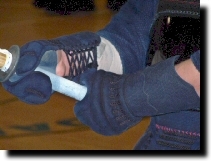 The footwork in kendo, particularly fumikomi ashi, the powerful lunging step, places enormous stress on this tendon. After stretching comes suburi, the repetitive stroking in the air with the bamboo sword (shinai). Usually, this consists of shomen uchi, forward men strike, using okuri ashi, slide stepping. When participating in this drill it is important to use big motions and take big steps. Push off with your left foot sliding your right foot forward while raising your shinai above your head with elbows spread wide. Quickly bring your left foot forward to a position slightly to the rear of your right while swinging your shinai forward and out with your left hand driving and your right guiding. At the point that your left foot comes to a stop and your shinai "strikes" an imaginary target, squeeze your hands inward and enthusiastically shout "MEN". It is crucial to coordinate your strike, your footwork, and your shout (kiai) so that they occur simultaneously. 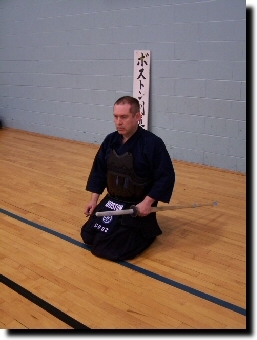 This is called "ki ken tai ichi", literally spirit - sword - body - one, and is one of the fundamental qualities of proper kendo technique (waza). Other forms of suburi may also be practiced, including hayasuburi, quick suburi, jo-ge-buri, suburi with a large motion, or naname-buri, diagonal suburi. In addition, other types of fundamental drills (kihon) may be performed as well, such as footwork drills (ashi sabaki), or striking a baton (uchikomi). All of these drills can, and should, be practiced by all members of the dojo, those who don the armor (bogu) and those who do not. 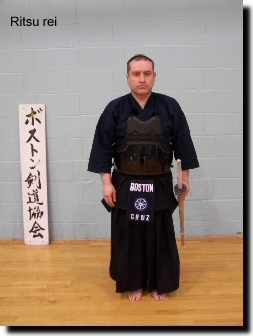 They represent the building blocks, the foundation for all other kendo techniques and methods. 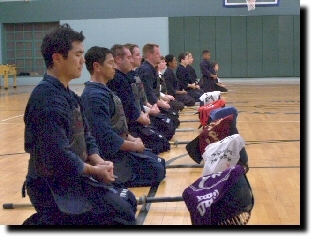 After the basic drills and techniques are performed, sempai will again call the dojo to line up and be seated. This time sempai will instruct the advanced students to put on their men (men o tsuke). They will then pull their men and kote in front of them and start by wrapping a cotton towel (tenugui) around their head in a sort of turban. This will absorb their sweat and prevent their hair from obscuring their vision. Next, they will place the face mask (men) on their heads and tie it securely. Finally they will put on their gauntlets (kote), left first then right, retrieve their shinai and stand up, ready for more advanced kendo practice. At this time, beginners should also retrieve their shinai and stand up. There are still many drills and techniques in which beginners are able to participate. In fact, the only practice that beginners cannot perform is free practice (ji-geiko), the actual fencing, which by its nature requires that both kendoka have bogu. Once everyone is standing the dojo pairs up and practice is conducted in a rotational fashion called mawari geiko. Each pair of kendoka begins by bowing to each other and shouting, "onegai shimasu", which can be translated as "by your leave". They raise their shinai to their waist placing their thumb on the guard (tsuba), simulating having a sword in their sash (obi). Then they take three steps forward, draw their shinai, point it at the other's throat, and squat down on their heels (sonkyo). This is analogous to the "en garde" in western fencing, a moment to ensure that both kendoka are ready for fair play. They then stand up in the defensive position (chudan no kamae) and engage in the various drills and methods of practice that the teacher (sensei) determines is appropriate. After each drill is completed, the kendoka return to their starting point, tips of the shinai touching, and assume sonkyo position, sheath their shinai (osame toh), stand up and take five small steps to the rear. The kendoka then lower their hands from the taito position and bow slightly while shouting, "domo arigato gozaimashita", "thank you very much". Everyone rotates one position to their right and gets a new partner for the next iteration. This continues until the end of practice, or until the sensei announces that free practice shall be allowed. At that point, everyone is free to practice any drill, method, or technique with anyone else. The advanced students usually prefer free fencing. Beginners should take this opportunity to practice with any available sempai, or sensei. Whenever someone is available, take a position opposite them; make eye contact; bow and shout "onegai shimasu". They are obligated to practice with you and help you in your practice. Follow the procedure described above to begin practice which will usually consist of uchikomi geiko, directed striking. Sensei will show you an open target that you are expected to strike. This will be repeated for several iterations. When sensei feels that sufficient time and attention has been given, they will signal an end to practice and assume sonkyo position. You should hurry to take up your sonkyo position, so that both may perform osame to, stand up, take five small steps rearward, lower your hands to sageto and bow. You should shout, "domo arigato gozaimashita" with sincere appreciation for the attention you received. Then find another sempai to practice with. When practice is over sempai will again call the dojo to line up and be seated. Waiting until sensei has removed his men, sempai will call the dojo to attention and instruct the students to remove their men (men o tore) and kote. When all the students have complied and placed their men on their kote and their tenogui over their men, sempai will, once again, call the dojo to mokuso. This time everyone should meditate upon the day's practice and prepare to re-enter the everyday world. After mokuso, sempai will call the students to bow to the teacher and bow to the dojo head. In addition, sempai will call the dojo to bow to each other (otogai ni rei), at which every one expresses their thanks; the students for the attention they received from sensei and the teacher for the effort and determination of the students. At this point it is customary for everyone to individually thank those with whom they have practiced and to receive review and critique of their performance. 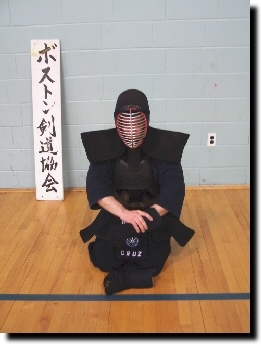 Good posture (kamae) is critical in kendo. You must strive to keep your spine perpendicular to the floor at all times. Shoulders should be relaxed and level. Keep your feet underneath your hips, hips underneath your shoulders. Keep your chin slightly held in. Your weight should be evenly distributed on both feet. 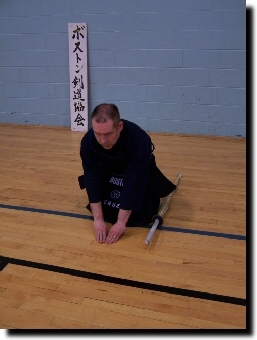 The stance used in kendo, left foot slightly behind the right with the left heel slightly raised, both feet parallel, is designed, primarily, for explosive forward motion. Its narrow base requires perfect posture in order to maximize stability. Your center of gravity (tanden) should be centered between your feet as shown in the diagram at the right. 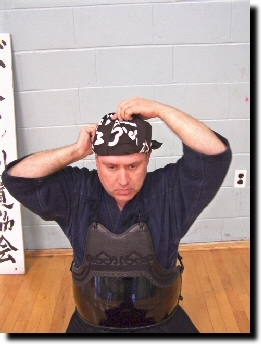 The most common kamae, used by most kendoka most of the time, is chudan no kame, the middle guard. The others are high guard (jodan no kamae), low guard (gedan no kamae), hidden guard (waki gamae), and eight direction guard (hasso no kamae). In chudan no kamae the shinai is held out in front of the body with the kensen ponted at your opponent's throat. The left hand is held about a fist's length away from your abdomen in a direct line with your tanden. The shinai should be in the center line of your body forming a triangle with your shoulders. This affords you the most protection as the shinai forms a natural wedge that will deflect attacks to the left or right. Chudan no kamae also allows to to attack all four targets (men, kote, do, and tsuki) without telegraphing your intentions. Your shoulders and arms should be relaxed, elbows pointing down. The shinai should seem suspended by your arms. Don't hold up the shinai; don't hold down the shinai. Another critical element of kamae is the grip on the shinai. Hold your shinai with the left hand at the very base of the tsuka, the baby finger almost sliding off the end. Use only the baby, ring, and middle fingers for a firm grip with the forefinger and thumb merely tucked away. Once you make this left hand grip do not change it! Fumbling around with your grip in mid-stroke takes time and focus away from a good strike. The right hand is placed further up on the tsuka with the right forefinger touching the tsuba. Use a similar three finger grip as the left hand, but with a much less firmness. If a line was extended down from the tsuru, it would bisect your thumbs at the base knuckle. Your grip should be more like a surgeon's on a scalpel than a lumberjack's on an axe; you are going to be executing cuts, not felling trees! Perhaps the most important aspect of kendo is footwork (ashi sabaki). The footwork most frequently employed in kendo is generally of a type called suriashi, or rubbing feet. What this means is that your feet should rub along the floor as you go. Do not lift your feet from the floor, but rather slide them in a kind of shuffle step. Keep your toes down and avoid thumping your heels on the floor. Sensei can tell whether or not your footwork is correct by the sound your feet make. A thumping or flapping noise indicating incorrect footwork; a swishing sound of your feet rubbing the floor indicating proper footwork. Try to move in a continuous fashion, one step blending with the next. There are a number of varieties of footwork in kendo, each with specific application. 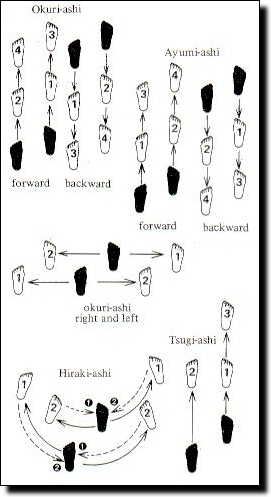 The most common form is okuri ashi, characterized by the feet remaining in relative position to one another at the beginning and end of each step. The left foot is slightly to the rear of the right with the heel slightly raised. Both feet are parallel to one another with the weight evenly distributed. Push your body forward with your left foot; right foot sliding out to the front. Immediately bring your left foot up to its position relative to the right, that is, slightly to the rear ready for another step if needed. Here is where one simple adjustment to your footwork can have enormous effect; reduce the amout of time that your feet are spread apart to the absolute minimum. Okuri ashi is used to move forward and backward as well as from side to side. Ayumi ashi is characterized by each foot moving forward in turn, similar to normal walking. The difference is that the feet still rub along the floor, toes down. 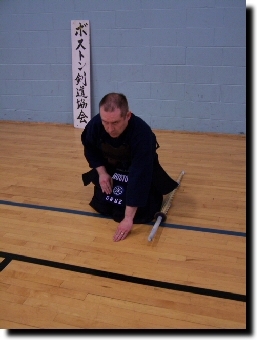 This footwork is used at the beginning of pair practice when you take three steps forward, draw your shinai and assume sonkyo and at the end when you take five steps to the rear. It is used in kiri kaeshi, the intense diagonal cutting drill, by the receiver (motodachi) to move forward and back facilitating a smooth flowing practice. It is also used in kendo kata. Hiraki ashi is characterized by a diagonal movement that allows you to sidestep an onrushing opponent to deliver a counter stroke. Note that when stepping to your left your left foot is placed in front with your right foot slightly to the rear. 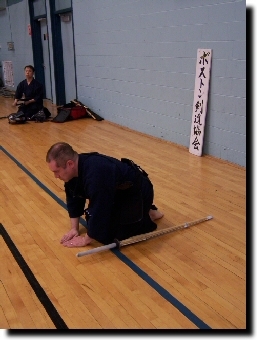 This footwork is used during some forms of suburi, during regular practice by motodachi to facilitate practice, and in kendo kata. Tsugi ashi, similar to okuri ashi, is used to close a long distance. 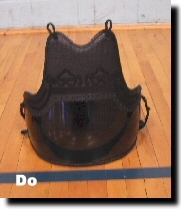 It is rarely used in kendo. Modern kendo kata developed from the koryu, old schools of swordsmanship, and had its beginning in the Keishicho Ryugenkiken Kata developed in 1887 for the Japanese Police forces.It consisted of ten techniques drawn from 10 of the most prominent ryu. In 1895, the Dai Nihon Butokukai, the All Japan Martial Virtue Society, was founded to encourage kenjutsu and other martial arts.In the following year its official Kenjustsu no Kata was introduced. In 1912, the Butokukai announced a new kata called the Dai Nihon Teikoku Kendo Kata, the Great Imperial Japan Kendo Kata consisting of seven odachi, long sword, and three kodachi, short sword, techniques. In 1928, the Zen Nihon Kendo Remmei was formed and accepted this kata, which was renamed Nihon Kendo Kata and remains as required study for advancement in kendo as it reflects the essence of classical kendo. These kata are conducted in a formal context with requisite etiquette observed. Strong posture, swift decisive movement, precision timing and control and an element of danger characterize these fascinating forms. 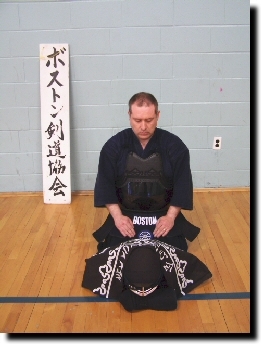 Not only are these kata an important link to past, they also serve to illustrate the fundamental principles, technical and philosophical, embodied in the techniques of kendo. 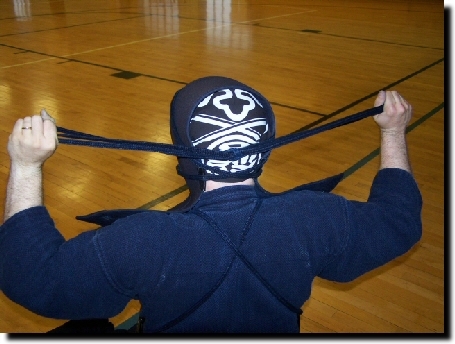 Kendo kata is a paired exercise. Uchidachi, the striking sword, is the aggressor who initiates the kata. Shidachi, the performing sword, is the defender who executes the demonstrative waza. Usually, uchidachi is sempai, or senior, while shidachi is kohai, or junior. Uchidachi provides the guidance and leads shidachi through the kata. Shidachi takes his cue from uchidachi and waits for uchidachi to move first before responding. Shidachi shouldn�t wait to long though, as the kata should appear to an observer as flowing smoothly with the two kenshi moving simultaneously. 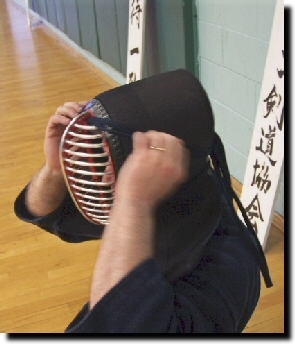 A unique aspect to kendo kata is the use of kiai, or spirit-shout. Kiai is the focused application of bringing voice to breath, thus demonstrating the presence of spirit, a key component of ki ken tai ichi (spirit, sword, body, unity). Uchidachi and shidachi each have a different sound, �Ya� and �Toh� respectively. Kiai is properly exercised by using the diaphragm and abdomen to draw breath deep into the lungs and expel the air forcefully through the windpipe and vocal chords. 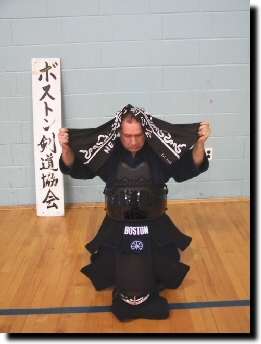 One of the major psychological and spiritual aspects of kendo is ki ken tai itchi, the unification (itchi) of spirit (ki), sword (ken) and body (tai). On the psychological level it involves marshalling all of one�s human faculties, intellectual, emotional and physical to accomplish a difficult task. On the spiritual level it involves transcending the everyday reality and literally becoming one with the sword. 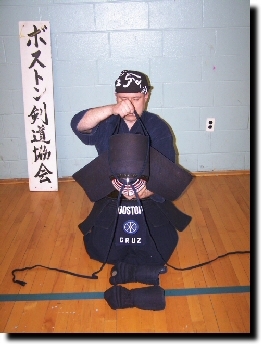 On the practical level it is the coordination of the breath with the stroke of the sword and the movement of the body in the application of a kendo technique, such as shomenuchi. 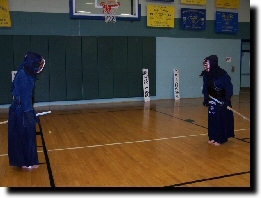 Footwork, or ashi sabaki, is the single most important aspect of kendo. Without it one cannot close the distance to strike nor avoid the attack of one�s opponent.Generally, kendo footwork can be characterized as suri-ashi, rubbing feet. That is, the feet are slid along the floor while keeping constant contact. There are three varieties used in kendo kata: ayumi-ashi, okuri-ashi and hiraki-ashi. Ayumi-ashi is used to cover large distances. Okuri-ashi is used for short, rapid attacks. Hiraki-ashi is used to sidestep an attack and position for a counter attack. 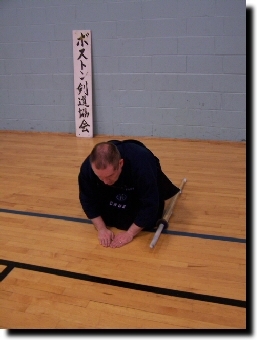 Okuri-ashi is the most commonly used footwork in kendo. 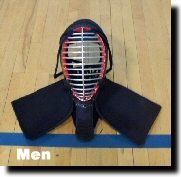 It is used in combination with most attack and defense techniques. The starting point is to have the left foot slightly behind the right with the heel raised up of the floor about an inch.The body weight is evenly distributed on both feet. Pushing off on the left foot, the right foot is slid forward. The left foot is brought forward to take a position slightly behind the right. In this way a kenshi can move forward very quickly and remain in good balance ready for any situation. Ayumi-ashi is similar to normal walking except that the feet are sliding across the floor. By alternating the feet, left and right, a large distance can be covered very quickly. 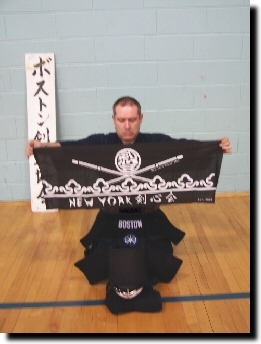 Ayumi-ashi is used in kendo kata when the performers move forward to reach issoku-itto, the striking distance, and when retreating after each waza is completed. Hiraki-ashi is used to side step an attacking opponent creating an excellent opening for a counter attack. When stepping to the right the right foot is moved first with the left coming around behind the right. When stepping to the left the left foot is moved first with the right foot coming around behind the left. All these kata are performed with the bokken, sometimes called bokuto, the wooden training sword of kendo. It is designed to simulate the weight, length and feel of a katana. The important parts are the tsuka or hilt, the tsuba or hand guard, the kensen or sword point, the mono-uchi or cutting edge and the shinogi, a ridge running the length of the blade used in parry techniques. In an interesting side note, many samurai including the famous Miyamoto Musashi, preferred the bokken in duels and battles as they felt is was less likely to break than a steel blade. 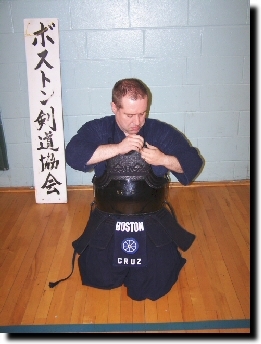 The techniques, or waza, of kendo are very direct, very economical, and of course, very deadly. When performing kendo kata, extreme care must be taken as injury, or even death, could occur if struck with a solid bokken with a full stroke in a vital area. Avoiding this possibility requires full attention, complete concentration and control. The primary technique is the shomen-uchi, the straight cut to the forehead. Most of uchidachi�s attacks are shomen-uchi. The secondary technique is kote-uchi, the cut to the wrist. Next is tsuki, the only thrusting technique. 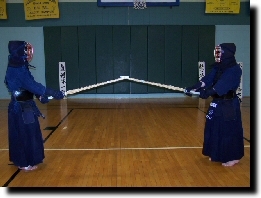 Two variants of this intimidating waza are used in kendo kata. One with the blade turned parallel to the floor, the better to slip between the ribs, and the second with the blade perpendicular to the floor, used to penetrate under the solar plexus and up into the heart and lungs.Finally, there is do-uchi, the great sweeping cut to the torso, used only once in kendo kata. 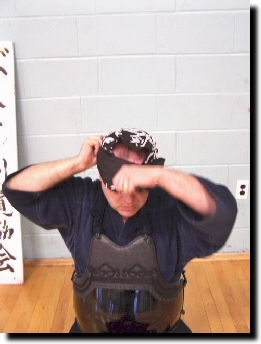 Men-uchi is the primary technique of kendo. 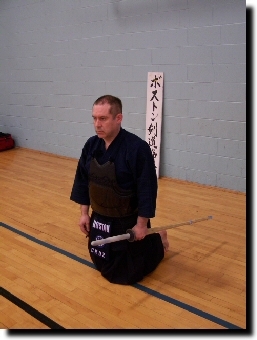 From the chudan no kamae posture it is executed by raising the bokken over one�s head such that it is pointing upward and back at a 45 degree angle and then swinging the bokken outward toward the opponent�s forehead.This is done in a continuous fashion while stepping forward using one of the ashi sabaki, usually okuri-ashi. From the jodan no kamae posture one needn�t raise the bokken since it is held there in this kamae. Kote-uchi is executed by raising the bokken over one�s head such that it is pointing upward and back at a 45 degree angle and then swinging the bokken outward and down toward the opponent�s right wrist. Tsuki, the only thrusting waza in kendo, is executed by thrusting the bokken forward toward the opponent�s throat keeping the blade perpendicular to the floor while stepping forward using ashi sabaki, again typically okuri-ashi. Alternatively, the blade is twisted such that it is parallel to the floor and thrust at the right side of the opponent�s chest just below the pectoral muscle as if to slide between the ribs to pierce the heart and lungs. Do-uchi is executed by raising the bokken over one�s head such that it is pointing upward and back at a 45 degree angle and then swinging the bokken outward and down toward the right side of the opponent�s trunk, the blade is turned diagonally 45 degrees, while stepping forward using ashi-sabaki. Kamae, or posture, are the fighting positions uchidachi and shidachi assume from which to launch their attacks and defenses. The two most common kamae are jodan no kamae, the high guard posture, and chudan no kamae, the middle guard posture. Both of these kamae are also used in shinai kendo as they have proven to be the most practical and effective for fencing. The others include gedan no kamae, the low guard posture, hasso no kamae, the eight direction posture, and wakigamae, the hidden posture. These kamae are almost never used in fencing, but are used in kata to demonstrate important concepts about distance and psychological states. 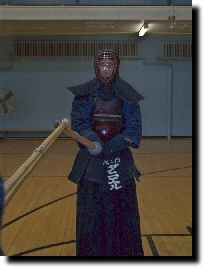 Chudan no kamae, middle guarding posture, is the most basic kamae in kendo.During kendo keiko (fencing) it is the most widely used as it affords the best protection and allows a kenshi to attack all four targets (men, kote, do, and tsuki). The bokken is held in front of the abdomen with the kensen aimed at the opponent�s throat. The left hand is about a fist distance from the abdomen approximately level with the navel. 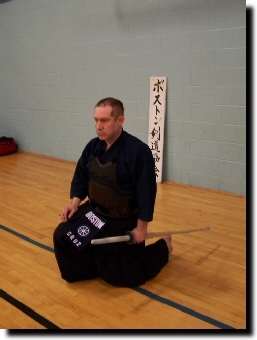 Jodan no kamae, the high guarding posture, is also used in kendo keiko.It is a highly provocative stance that sacrifices protection for a more aggressive attacking platform.There are two varieties. In hidari-jodan (left jodan) the bokken is raised overhead such that it is pointing upward and back 45 degrees while the left foot is brought forward. The left hand should be about a fist distance from the left forehead.The bokken is shifted slightly off the center-line to the right, about 10 degrees. In migi-jodan (right jodan) the bokken is held in the center line and the upper torso is turned slightly to the left, about 5 degrees. The right foot is forward. In both forms the elbows are opened just past the shoulders. Gedan no kamae, the low guarding posture rarely is used in fencing as it leaves the kenshi wide open to men and tsuki attacks. 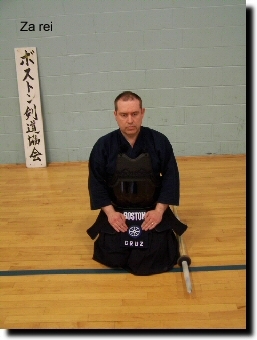 Only the very brave or foolish would use it.It is achieved by lowering the kensen to knee level from chudan no kamae. The bokken is held in the center. Hasso no kamae, the eight direction posture � so named because it is theoretically possible to execute a cut in any direction � is also rarely used in fencing. 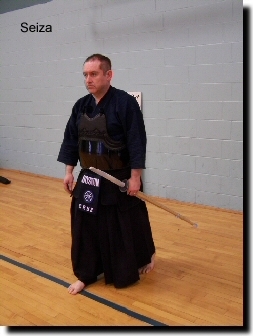 This posture is assumed by raising the bokken above the right shoulder then lowering it until the left hand is in front of the sternum while stepping forward with the left foot.The blade is pointing up and slightly back over the shoulder with the blade running along the jaw line. Waki-gamae, the hidden guard posture, is also rarely used in fencing.This posture is assumed by raising the bokken up and back to the right in a large sweeping motion while stepping back with the right foot. The body is turned slightly to the right, about 10 degrees. The bokken is held close to the right hip and extended back and down at a 45 degree angle. The blade is turned at a 45 degree angle. The bokken should be hidden from the opponent. The theory behind this kamae is to prevent the opponent from knowing the length of your sword, thus making it impossible for him/her to properly judge the distance at which you can strike. 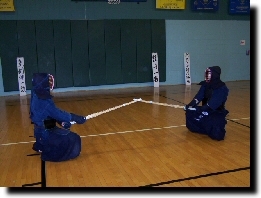 Between the various waza performed during kendo kata the two performers will lower their bokken to knee level turning the blades toward the center while opening slightly to the right, about 5 degrees. This motion is called kamae-otoku, lowering the guard. The performers then back away five small steps using ayumi-ashi. Kendo no kata should be more properly seen as a performance art and should incorporate elements of drama, elegance and aesthetics. Body language, facial expression, rhythm and timing become important components as well. 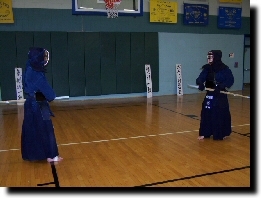 After an initial learning curve, kenshi should approach kata with this mind frame.Observers of kendo kata should sense the danger, the conflict and tension, the suspense as well as admire the elegant movements, the mastery and control of the sword and feel transported to another place and time, perhaps watching Miyamoto Musashi and Sasaki Kojiro dueling to the death on the beach at Ganryu Jima. This mood is set by the proper attention to reiho, the traditional etiquette of kendo kata. These rituals are completely alien to most Western audiences and create an atmosphere of mystery and curiosity. For the performers it serves to focus the mind on the moment and places them in context and character. Kendo kata begins with uchidachi leading shidachi to the center of the performance space. They face each other; assume seiza placing their bokken to the side, and formally bow to each other, zarei. They retrieve their bokken, stand and proceed to positions opposite each other nine paces apart.They face forward to the kamiza, or the head of the dojo, and bow deeply, ritsurei. Turning to face each other once again, they bow less deeply this time.Up to this point uchidachi and shidachi have been carrying their bokken in their right hand which represents a non-hostile intent. They slowly bring the bokken in front, careful not to obscure their vision, and switch the bokken to their left hand and lower it to their left hip with the thumbs held on the tsuba. This represents placing the sword into their obi, a belt worn for the purpose of holding a katana. With uchidachi initiating, the performers take three bold steps toward each other using ayumi ashi while drawing their swords. As they reach the third step, they assume chudan no kamae at issoku itto ma-ai pointing their kensen at the other�s throat and then slowly descend into sonkyo, the crouching �en garde� position of kendo. Sonkyo is meant to assure each other that they have no dishonorable intent and are not planning any sneak attacks. After rising back to chudan they lower their kensen in a move called kamae otoku and retreat five steps using a slow, cautious, small ayumi ashi and then assume chudan no kamae. Uchidachi and shidachi then proceed to perform all seven waza in sequence.They begin each by assuming the kamae appropriate for that waza and advance to issoku itto. They end each waza by returning to chudan no kamae at issoku itto, perform kamae-otoku and retreat five steps to the nine pace distance. After the last waza and before retreating, uchidachi and shidachi move into sonkyo, symbolically re-sheath their swords by placing the bokken on their left hip, stand up and retreat five steps. They return their bokken to their right hands and bow to each other. Facing kamiza once again they bow deeply. Uchidachi assumes hidari-jodan posture. 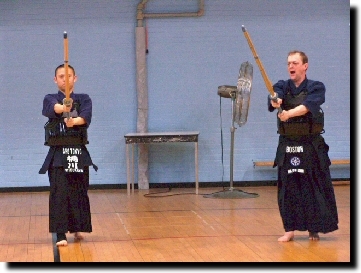 Shidachi responds by assuming migi-jodan posture.The performers advance three steps forward using ayumi-ashi. Uchidachi steps forward with the right foot executing a large sweeping shomen-uchi cut.The momentum of the cut takes uchidachi slightly off balance, leaning forward. The trajectory of the bokken is meant to cut shidachi from fingers to groin. Just before uchidachi�s cut strikes, shidachi slides back one step using okuri-ashi and uchidachi�s cut misses. Shidachi immediately steps forward using okuri-ashi and counters with shomen-uchi. Uchidachi straightens up and shidachi drops the kensen right between his/her eyes. Uchidachi takes a small step backward using okuri-ashi. Shidachi steps forward with the left foot and assumes hidari-jodan.Uchidachi steps back again using okuri-ashi narrowly avoiding shidachi�s kensen. After sufficient zanshin, uchidachi raises his/her bokken to chudan no kamae while shidachi steps back with the left foot and lowers his/her bokken to chudan no kamae. The performers assume kamae-otoku, retreat 5 small steps using ayumi-ashi and return to chudan no kamae. Uchidachi and shidachi remain in chudan no kamae. The performers advance three steps forward using ayumi-ashi.Uchidachi steps forward using okuri-ashi executing a kote-uchi cut. Just before uchidachi�s cut strikes, shidachi drops his bokken to gedan level, slides back diagonally to the left one step using okuri-ashi. As uchidachi�s cut misses, shidachi immediately steps forward using okuri-ashi and counters with kote-uchi. After sufficient zanshin, uchidachi raises his/her bokken to chudan no kamae while taking one step back using okuri-ashi. 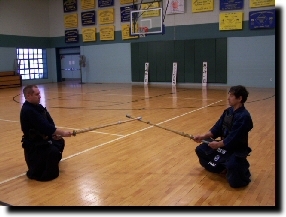 Shidachi steps back to the center passing his/her bokken over uchidachi�s to chudan no kamae. The performers assume kamae-otoku, retreat 5 small steps using ayumi-ashi and return to chudan no kamae. Uchidachi and shidachi both lower to gedan no kamae. The performers advance three steps forward using ayumi-ashi. With uchidachi initiating, both slowly raise their bokken to chudan. Uchidachi steps forward using okuri-ashi executing tsuki while turning the blade flat. Shidachi immediately steps back using okuri-ashi while controlling uchidachi�s bokken by sliding his/her bokken back using the shinogi. Once uchidachi�s thrust is neutralized, shidachi counters with tsuki stepping forward using okuri-ashi. Uchidachi steps back with the right foot parrying with a sharp motion using the right side shinogi. Shidachi executes another tsuki stepping forward with the left foot. Again, uchidachi steps back with the left foot parrying with a sharp motion using the left side shinogi. Uchidachi quickly retreats three steps using ayumi-ashi starting with the left foot. Shidachi chases uchidachi back stepping forward three times also using ayumi-ashi aiming his/her kensen between uchidachi�s eyes. After sufficient zanshin, uchidachi raises his/her bokken to chudan no kamae.Shidachi slowly retreats five steps using okuri-ashi while maintaining chudan no kamae. Uchidachi follows shidachi stepping forward three steps using ayumi-ashi. The performers assume kamae-otoku, retreat 5 small steps using ayumi-ashi and return to chudan no kamae. Uchidachi assumes hasso no kamae. Shidachi responds by assuming waki-gamae.The performers advance three very small steps forward using ayumi-ashi. Uchidachi steps forward with the right foot executing a shomen-uchi cut. Simultaneously, shidachi immediately steps forward using okuri-ashi and counters with shomen-uchi. Since they were at a far distance, toh-ma�ai, their bokken clash and �stick�. With uchidachi initiating, both performers lower to chudan no kamae while keeping their bokken in tight contact. Uchidachi executes tsuki turning the blade flat while stepping forward using okuri-ashi. Shidachi parries the thrust by lifting his/her bokken while keeping contact with uchidachi�s bokken, side stepping to the left using hiraki-ashi. Shidachi, in a continuous movement, counters with shomen-uchi. After sufficient zanshin, uchidachi returns to chudan no kamae while taking one step back. Shidachi steps back to the center with the right foot and lowers his/her bokken to chudan no kamae. The performers assume kamae-otoku, retreat 5 small steps using ayumi-ashi and return to chudan no kamae. Uchidachi assumes hidari-jodan posture. Shidachi responds by slightly raising his/her kensen aiming at uchidachi�s left wrist. The performers advance three steps forward using ayumi-ashi. Uchidachi steps forward with the right foot executing shomen-uchi cut. Just before uchidachi�s cut strikes, shidachi slides back one step using okuri-ashi deflecting uchidachi�s strike using the left shinogi in a circular motion called suriage. Shidachi immediately steps forward using okuri-ashi and counters with shomen-uchi. Shidachi steps back with the right foot into hidari-jodan with a motion that simulates cutting uchidachi�s face. After sufficient zanshin, uchidachi raises his/her bokken to chudan no kamae while shidachi steps back with the left foot and lowers his/her bokken to chudan no kamae. They both move back to the center by taking three small steps using okuri-ashi while maintaining chudan no kamae. The performers assume kamae-otoku, retreat 5 small steps using ayumi-ashi and return to chudan no kamae. Uchidachi remains in chudan no kamae. 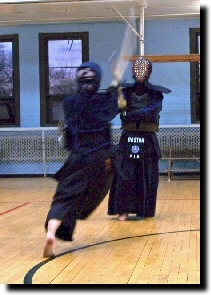 Shidachi responds by lowering into gedan no kamae.The performers advance three steps forward using ayumi-ashi. Shidachi slowly raises his/her kensen to chudan. Uchidachi, unable to stop shidachi, steps back quickly with the right foot into hidari-jodan. Shidachi closes the gap raising his/her kensen aiming at uchidachi�s left wrist. Uchidachi steps back once again quickly with the left foot into chudan and executes a fast kote-uchi with a small motion. Just before uchidachi�s cut strikes, shidachi side steps to the left using hiraki-ashi deflecting uchidachi�s strike using the right shinogi in a circular motion called suriage. As shidachi brings the right foot around behind the left he/she counters with a small, fast kote-uchi. Uchidachi steps back diagonally to the left using okuri-ashi lowering his/her bokken to gedan and turning the blade toward shidachi. Shidachi steps forward with the left foot into hidari-jodan. After sufficient zanshin, uchidachi raises his/her bokken to chudan no kamae while stepping forward to the center. Shidachi steps back with the left foot and lowers his/her bokken to chudan no kamae. The performers assume kamae-otoku, retreat 5 small steps using ayumi-ashi and return to chudan no kamae. Uchidachi and shidachi remain in chudan no kamae. The performers advance three steps forward using ayumi-ashi.Uchidachi steps forward using okuri-ashi executing a small tsuki turning the blade parallel to the floor.Shidachi slides back using okuri-ashi extending his/her arms raising uchidachi�s bokken with the left shinogi turning the blade flat. Uchidachi takes two steps forward using ayumi-ashi, first the left then right while executing a large sweeping shomen-uchi. Just as uchidachi begins his/her strike, shidachi steps diagonally to the right three steps using ayumi-ashi executing a large sweeping do-uchi. On the third step shidachi lowers his/her knee to the floor. Shidachi maintains eye contact throughout this movement. After sufficient zanshin, uchidachi moves through wakigamae stepping back with the left foot while raising the bokken over head and down into chudan no kamae and turns to face shidachi. At the same time shidachi snaps his/her bokken to wakigamae raises his/her bokken over head and down into chudan no kamae while swinging around sharply to face uchidachi straight on. Uchidachi steps back once using okuri-ashi maintaining chudan no kamae. Shidachi rises and steps forward with the right foot maintaining chudan no kamae. Uchidachi and shidachi rotate clockwise 5 steps keeping the bokken in contact at issoku-itto. The performers lower into sonkyo, move their bokken to their left hip as if returning a sword to its scabbard and rise to standing.They then retreat 5 small steps using ayumi-ashi. They exchange the bokken from the left hand to the right and lower it to the right side and bow.